The summer is quickly passing by. In just a few weeks, school will be back in session. For most churches, there are usually two growth seasons each year. The first period of growth happens from around mid-January and goes through Mother's Day. The second period of growth happens two to three weeks after school starts back and runs through the first of November. It's important to rally everyone as you prepare for the fall ministry season. Your volunteers, who have missed some weeks for vacation or took the summer off, need to be re-engaged and equipped for the upcoming ministry season. Another goal is to get everyone excited and focused on the vision again. If you haven't planned a training yet, you've still got time. A good time to have fall training is anytime between mid-August to early September. When planning a training, it's important to make it worth their time. Someone said the reason people don't come to trainings, is because they've been before. If that's been the case in the past, this is a great time to turn it around and have an amazing training. You can do it if you have a plan. 1. Fun - There should be laughter. Lots of it. This can be done through funny skits, games, jokes, videos, etc. 2. Festive - Make it a party. Decorate with a theme. Play music when they are arriving. Give away door prizes. 3. Food - Serving food shows your volunteers you value them. Plus, it's hard for people to focus on training when their stomachs are growling. 4. Family-Friendly - Provide childcare and food for their children. Avoid having the training on a school night. 5. Focus - Be prepared. Know exactly what the agenda is and what you are going to cover. 6. Faith-Building - Remember, we are called to make disciples. The training should not only help them grow in their ministry skills, but in their faith as well. One goal of the training should be to deepen their walk with Christ. 7. Felt - There should be a moment that is memorable and leaves a tear in their eyes. An "ah ha" moment. Remind them why they serve. Encourage them. Thank them for the difference they are making. If possible, give them a small gift to express your appreciation. This training is very important. 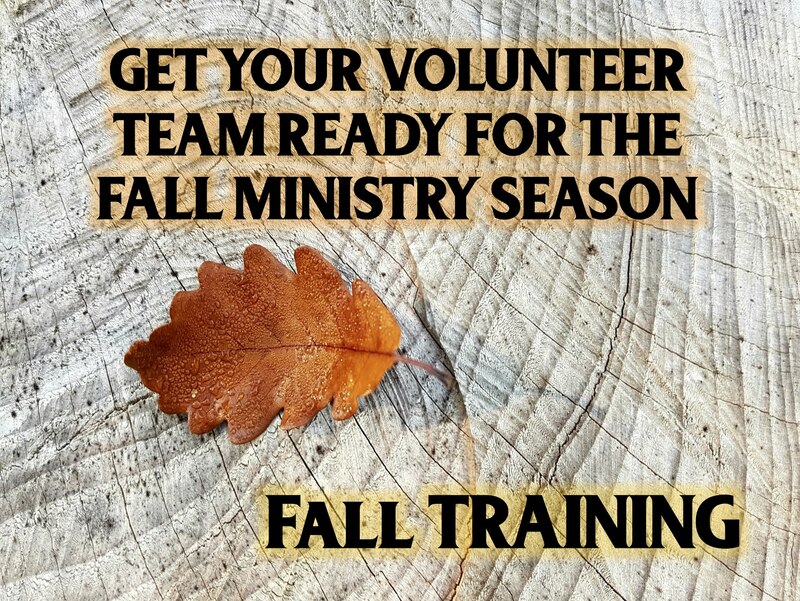 It will set the tone for your fall season of ministry. I'd be glad to support you for your fall training. Here are some ways I can serve you and your ministry. Live, In-Person Training - I am available for live trainings. I have a few openings in August and September. I am glad to work within your budget. If you'd like me to come and do a live, in-person training, you can get more information at this link. Having someone come in from the outside to encourage and equip your volunteers can make a big impact. It reinforces what you have been telling them. Live Online Training - Another option is live, online training. All you need is your computer and an internet connection. Dozens of churches across the country have used this. The training includes 1 hour of teaching and Q & A. The session is also recorded so you can send it to anyone on your team who could not be there. You can get information at this link. Cost is only $99. Training Resource - Dozens of churches across the country have used this training. It is called "Connections" and trains volunteers how to connect with today's kids and build relationships with them. Includes ready-to-print handouts for volunteers and media slides you can use in Power Point, Pro Presenter, Media Shout, etc. This resource is available as an instant download. You can get it at this link. Believing with you for your greatest fall ministry season ever. New families are going to come. Kids and their parents will come to faith in Christ. God will send new volunteers to help you. Your ministry is going to grow. Get ready for it. Pray for it. Believe God for it. Be prepared for it.